We are certainly judging this book by its cover – it looks awesome. 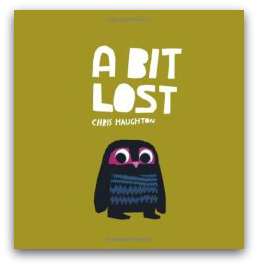 Chris Haughton’s A Bit Lost has attracted LOTS of attention – notably being the first book to win both Bisto Children’s Book of the Year and the Ellis Dillon Award. This picture book begins with a clever half page flap, which the kids turn over to reveal that Little Owl has fallen out of the tree …. leaving mum behind. 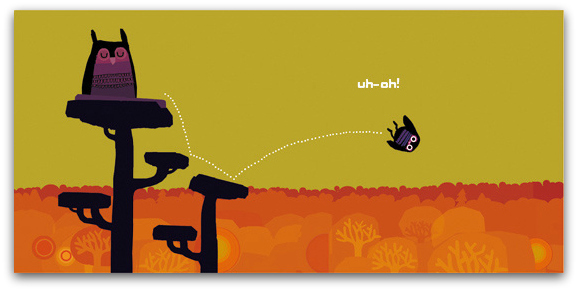 And so begins the premise of the story – Little Owl trying to find his mummy. This is handled with great humour as Little Owl is befriended by squirrel who asks him what his mummy looks like! With each snippet of a description squirrel leaps in with an “I know! I know!” and goes off to find …. a totally unsuitable animal. For example, the description “VERY BIG” leads to a bear – this is where the giggles came from! The illustrations are stunning. The burnt oranges and reds for the silhouetted forest are warm and comforting. The striking illustrations of each animal, with bold block colouring, convey their characters perfectly, and the cute owl with gorgeous large eyes …. well, it’s cuteness has even inspired art projects in Ohio. Simple, short lines of text make it ideal reading for the younger age group. 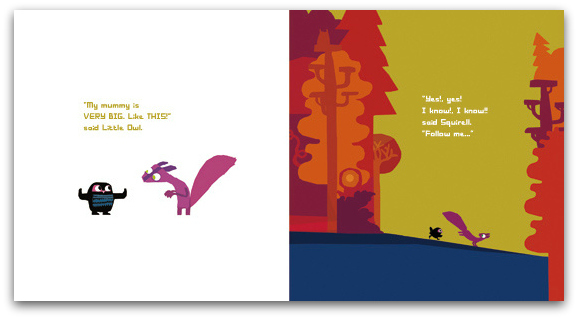 Read Chris Haughton’s interview with My Book Corner & delve into the very amusing Oh No, George! & Shh! We Have a Plan. A Bit Lost is a featured titled on our list of the Best Books for Mother’s Day. You can view all our suggestions here.